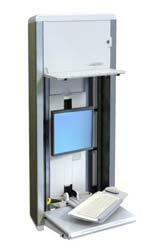 The StyleView Enclosure from Ergotron Inc. is a secure, complete, compact workstation that is designed for use in space-constrained patient rooms. 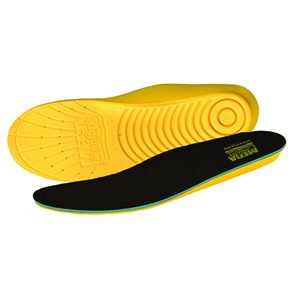 Its low-profile, vertical lift provides nine inches of smooth height adjustability. A keyless locking mechanism protects patient data and aids with HIPAA compliance. Summit Training Source's Back Safety: Lift for Life Video/DVD training program is filmed on site in multiple settings to show a wide variety of real-life scenarios. The program covers common back injuries, proper posture, hazard reduction, safe lifting, and other risk management factors. 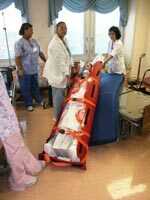 ARC Products' Med Sled uses a "roll and drag" method that is designed to eliminate heavy lifting while transporting patients down a stairwell. 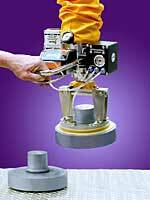 The product is made from a rigid plastic that ensures stabilization and limits flexing when moving a patient. Its braking system allows for safe and controlled descents. Stäubli Robotics' new heavy-payload robots, the TX200 and TX200L, are designed with load capacities ranging from 100kg to 130kg and have a maximum reach of 2,194 to 2,594 millimeters. 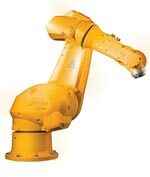 Additionally, the robots have six degrees of freedom, feature a fully enclosed structure, and are suitable for a wide variety of applications. With one first-time adjustment, North Safety Products' RITE-ON™ Harness is designed to always go on without further alteration. 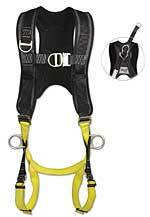 Ergonomic, lightweight (4.3 lbs), and tangle free, the harness can be worn for eight hours without having to remove it, increasing safety and productivity on the job site. Developed through four years of design, 16 prototypes, and extensive field testing, the new Adjus® series of height-adjustable workstations features state-of-the-art ergonomic designs to help reduce worker injury and enhance productivity. Each of three different configurations yields a 26.5-inch range of motion in as little as two seconds. Anver Corp.'s new Dual-Pump Tube lifter employs two vacuum pumps, allows for up and down operation, and provides an improved grip with 24" Hg continuous holding power. It also employs a 100-percent duty cycle, swivels 360 degrees, and can lift loads up to 350 pounds. Standard features include adjustable up/down controls on the handle, vacuum leakage sensor/warning system, and a wire-reinforced tube. For more information, visit www.anver.com.